A Comprehensive Range of Concrete Restoration Specialists Services in London! Concrete restoration Specialists companies cover a vast range of services. At London Structural Repairs, we are a team of NVQ qualified repair professionals who can fix any type of concrete problem. We can complete any type of concrete restoration specialists service with ease, offering maximum satisfaction. We not only meet industry standards, but exceed them by offering quality concrete repair specialists services in London and the surrounding areas. The methods we utilise to fix concrete walls and surfaces are internationally proven. We offer a comprehensive range of concrete repair specialists services to commercial and residential clients. With over 20 years of experience, our team is able to fix the most critical problems in concrete structures with ease. When it comes to concrete Specialists repairs, it is essential that you pick a company that is experienced, certified, and reliable. We offer concrete repair specialists services to keep your structures protected from any damage. In order for your building to keep in good shape for a long time, you need to repair it on an ongoing basis. Our team of professionals are not only able to fix minor concrete problems, but are also capable of handling critical repair tasks without the hassle. By making use of advanced concrete specialists repair techniques, our team of installers ensures that your structure is in pristine shape. By requesting concrete repairs from us, you can prolong the life of your structures. This is one of our projects which we carried out by use of a Scissor lift. 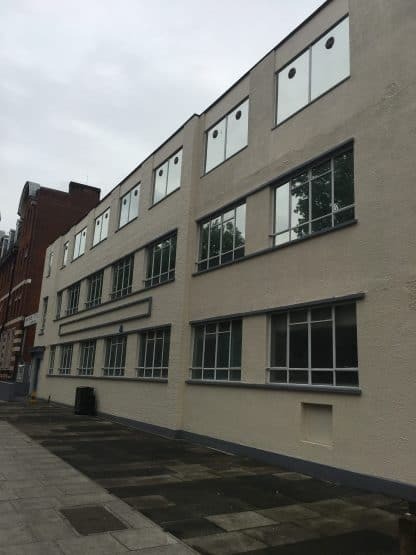 The property was being refurbished into offices internally and London Structural Repairs refurbished the front exterior of the property. Concrete repairs were carried out with the use of Sika concrete repair mortars. We then applied specialists coatings to give the building a new fresh clean look as well extra protection. We Inspect, Diagnose, and Implement Cost-Effective Concrete Repairs! Concrete structures, walls, and surfaces are prone to damage. Therefore, it is important to keep them in proper shape by calling a concrete repair professional. If you are looking for a service provider that is experienced and reliable, get in touch with us. London Structural Repairs excels at dealing with all types of repairs including concrete repairs. When a client gets in touch with us, we send over a team of experts who inspect the structure, diagnose the problem, and implement an effective strategy that is not only budget-friendly, but also ideal for preserving your building. Advance Concrete Repair Services in London! Concrete can disintegrate over time. However, if you perform routine maintenance and repair, you will be able to preserve it for a long time. London Structural Repairs aims at offering a complete range of concrete repair services so you can protect your building while saving lots of money. What makes us your go-to concrete repair specialists professionals is our connection with local authorities, property managers, and housing associations. We have successfully completed a vast range of projects for concrete repairs. If you need some tips for protecting and maintaining your concrete structures, get in touch with us for expert advice. If you manage, maintain or repair concrete structures and require methods of investigating, testing and repairing cracks in concrete be sure to contact London Structural Repairs for a free consultation.